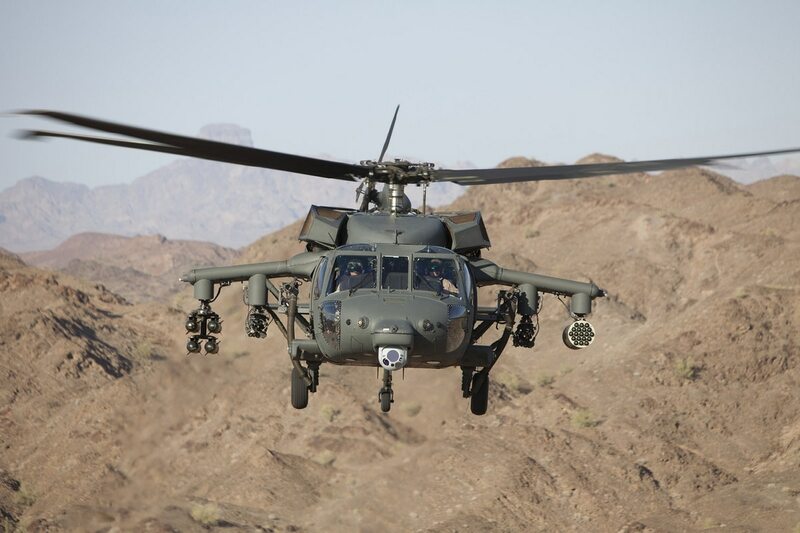 SINGAPORE — Sikorsky has completed qualification work on a comprehensive weapon suite for its S-70M and S-70i Black Hawk helicopters, the company said, enabling the aircraft to perform a variety of medium-attack missions. The completion of qualification work in 2017 concludes a six-year development program of the weapons system, including two years of live-fire tests at the U.S. Army’s Yuma Proving Ground in Arizona. Speaking at a news conference the day before the Singapore Airshow, Sikorsky Director of International Programs Joe Palumbo said that deliveries of the weapons kits have started for an unidentified customer using the helicopters in a “hot and dry” environment, believed to be the United Arab Emirates. Click here for more coverage from the Singapore Airshow. Christophe Nurit, Sikorsky’s vice president of sales and marketing for the Asia-Pacific region, added that the weapons suite is being marketed to users who do not need a dedicated attack helicopter. The addition of the weapons suite can include the Lockheed Martin AGM-114 Hellfire anti-tank missile, Hydra 70 unguided rockets in 7- or 19-shot pods, and the 12.7mm GAU-19 triple barrel Gatling gun mounted on four hardpoints on the Black Hawk’s stub wings. The system is fully integrated with its existing avionics, and it is cued and operated by the pilots with the assistance of the nose-mounted electro-optical sensor and helmet-mounted display, with the weapons system able to present continuously updated targeting symbols to each pilot’s helmet-mounted display. It can also provide target designation for the laser-guided Hellfire missiles, of which a maximum of 16 can be carried. In lieu of troops, the helicopter’s main cabin can also be used to carry additional ammunition pallets and auxiliary fuel tanks for the weapons when used as a medium-attack helicopter, or removed when the mission requires an armed assault helicopter.